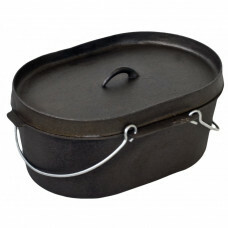 This Oval 10 Qt Cast Iron Dutch Oven is the ultimately perfect shape for a roast, Who has round legs of lamb? Not me. So this will be perfect! Made from First grade Cast Iron, this 10 Qt will be making your perfect roast for years to come.